The Laranjal course is the new kid on the block at Quinta do Lago and the reputation of their third course already is growing. The course is routed through orange groves – which is where the name Laranjal was derived – opening for play in February 2009 and designed by Portuguese architect Jorge Santana da Silva. Unusually, this new Quina do Lago layout is configured with five par fives, eight par fours and five par threes. The extra three-shot and one-shot holes provide a subtle change in balance to the many 4-4-10 configurations that are so prevalent across the world. We like Jorge Santana da Silva’s style and hope more architects consider his different approach. 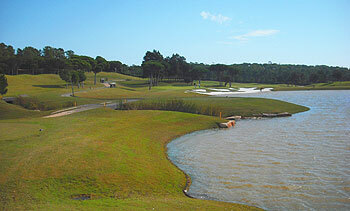 The Laranjal is the newest course in the Quinta do Lago resort and is by far the most open course. Wider fiarways but also longer holes. Some really testing holes witgh a lot of water in play. During our round the course was in pristine conditionand it was really fun to play. like the other Quinta do Lago properties a must play in the Algarve region. Played this as the last of 4 consecutive days and liked it very much although compared to the 3 previous days it was much more "compacted" into the land available with numerous crossovers and adjacent holes which - apart from much water - makes losing a ball a lot harder..so good holiday golf ! The 9th and even more so the SI 1 16th are both stunning par 5's each with more than one water crossing. Not specifically a problem with the courses themselves but it was frustrating that so there are so many "I have paid my money so I will do what I like" (supposed) "golfers" who leave pitch marks un-repaired and bunkers un-raked - who must have been out in their hordes on the day we played .... someone had played 3 shots in a bunker and walked out past the rake ...worse than an American Ryder Cup fan in my book !!!! I thoroughly enjoyed my round at Laranjal and it was good to be able to walk round a course in Portugal. We all agreed that this course would be great to start a trip with as it is fair but still a good course. There are a few holes here which stand out to me but the 11th par 3 and 16th par 5 are two of my favourites. The greens are exceptional only bettered this year by good old Hindhead and I was fortunate enough to get the read of these pretty well, unlike one of my player partners who 3 putted 4 times and 4 putted once, so be warned. If there were any negatives it is that you can feel on top of people at times. but this does not take away too much from the course. Having now played all the Quinta courses, this is definitely the 3rd best but this does not make this a bad course by any means. Having just come back from a weeks holiday in the Algarve.The course was in good condition and would be great as one of your first courses to play to ease you in. It is quite open and plays relatively forgiving; but it does have some long, testing holes (especially from the black tees).Not the best course in the Algarve, but by means the worst. Solid golf course in good condition. Soft opening and finishing holes but holes 5 through 16 are really good. Played early September on the Summer special deal and thoroughly enjoyed the course from start to finish. The elevation changes impressed throughout and coupled with large undulating greens made this course a pleasure to play. Good sat NAV on the buggy too ( which cut out btw if you try to go where you shouldn't!) Highly recommended in the Quinta da Logo area. Though every golfer may have his own opinion about courses, I find this comment a really strange one. Starting with you naming the 7th 'stupid' hole as one of the only memorable holes, which it is definitely not. It might even be one of the less spectacular holes. I would prefer to give the readers #6, #9, and #17 as memorable holes. To set things clear for others, which are interested in playing this course : I've played this course many times, just like all other courses in the Algarve area, and this is definitely one not to miss. It is a very young course, so you should give it the time to get mature, however, it is still one of the most fun courses here to play. If you want some useful advice about "busyness" on the course... 90% of the year you will be able to play your round in 4 hours. It is like, never busy, on this course. I am telling you this with local knowledge, not with a 1 time-experience. It is very difficult to see why this course is not rated higher. I’ve been lucky enough to play it on numerous occasions and it surely has to be one of the finest courses in the Algarve. Admittedly the first couple of holes and the final hole are slightly disappointing in comparison to the rest of the course, but only because the rest of the course is so good! Laranjal has fairly distinct feel about it compared to other courses in the area given that it’s slightly more isolated and you’re not weaving your way through villas. One of the most prominent features of the course is the large, severely undulating greens that provide a stern challenge. There are a number of terrific holes over water, including two fantastic par 5s and three par 3s, none of which are in any way gimmicky. The clubhouse is classy and understated which in many respects serves to ensure the course is the highlight of the visit. Cannot wait to come back and play here next summer, hopefully with the putting wand in better form! Only 5 stars as the first and last holes maybe don’t do it justice, but if you’re in the Quinta/Vale de Lobo area than most definitely worth a visit. I played Laranjal as the 3rd of a three course package - the other two being the North and South courses of Quinta do Lago. It was the best of the three by a fair distance.The standard of the greens was absolutely fantastic - they were 'stimping' at 12 the day I played .... very, very fast ... but beautifully true.A fantastic varied layout with many holes that are really pleasing to the eye.Can't wait to go back some time in the future and have another go! The third and newest course of the resort is Laranjal and I would imagine that for very good golfers (6 handicap and below) it will probably be the best test. For me though with a mid range handicap, I place the South and the North ahead probably because they are better looking courses. In saying that, based on the many courses I have played on the Algarve, Laranjal’s ranking should be a little better. There are five par-5’s on this course and I’ll mention four of them here, the 6th has a tough drive because of the left to right sloping fairway and a couple of bunkers on the edge of the right rough, the green is raised so any approach shots need to come in from height. The 9th is the fun hole of the course; the drive needs to avoid water on the left, the lay-up needs to avoid water on the right which then continues to protect the green too. The best hole on the back nine is the 16th, another quality par-5 with water to contend with on at least two shots to the green. The pick of the par-3’s is the 11th, pretty long (210 metres from the back tee) with water and sand to carry to reach the green, it is like a longer version of the 17th at the Bay Hill Club, FL. Last things to mention; the course has been designed through an old orange grove, so there are no excuses not to top up your vitamin C during the round – last point and it is the remaining par-5 (the 18th) …. just not a great finishing hole if you ask me – a little long and un-interesting. Glad I have now completed the trio of Quinta do Lago courses but the South and North are my preferences…..